The Avg. Group Discount is 12.2%! US Capitol, White House, Smithsonian, American Portrait Gallery, Verizon Center, Shakespeare Theatre, National Mall, Tidal Basin, Jefferson and Lincoln Memorial, WW II and Korean Memorial, Holocaust Memorial, Intl Spy Museum, Crime and Punishment Museum, National Law Enforcement Memorial, National Building Museum, Ford's Theater. 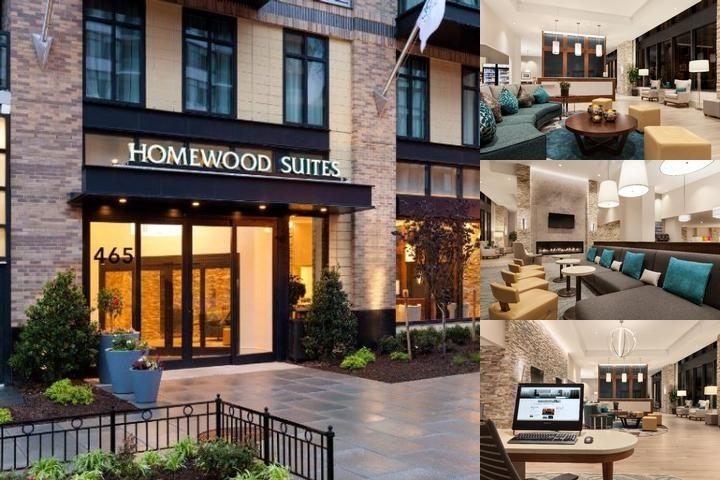 Perfect for business and leisure stay, the brand new Homewood Suites Washington DC Convention Center has 160 all-suite rooms with full kitchen. Enjoy the savings of a complimentary hot breakfast buffet served daily, complimentary wi fi, complimentary use of our 24 hour Fitness Center and complimentary Evening Social (Monday to Thursday, food and beverage). Walk 2.5 to 3 short blocks to City Center/ Chinatown/ Verizon Center or the Arts and Entertainment District and Convention Center. A brand new 24/7 Safeway Grocery is across the street. Walk to many dining choices from value to high end. Walk to the shopping district. Walk 2.5 to 3 blocks to Metro Station (Gallery Place (yellow, green and red lines) or Convention Center metro stop (yellow and green lines). So convenient! Guests are encouraged to reuse towels during their stay. Linens are changed at minimum, once a week or upon check out. Group cancellations will be confirmed directly with group. Local Shuttle Info: There are various shuttle options on site. Please inquire with the Hotel directly. Hot Full Breakfast Buffet, Complimentary with hot items such as waffles, eggs, sausage, oatmeal, potatoes etc. and cold items such as breakfast breads, fruit, parfaits, etc. Evening Social, complimentary with lite dinner fare weekdays, Monday - Thursday. The menu rotates daily, however the Evening Social offers entrees, soups, salad and non-alcoholic beverages, free of charge. 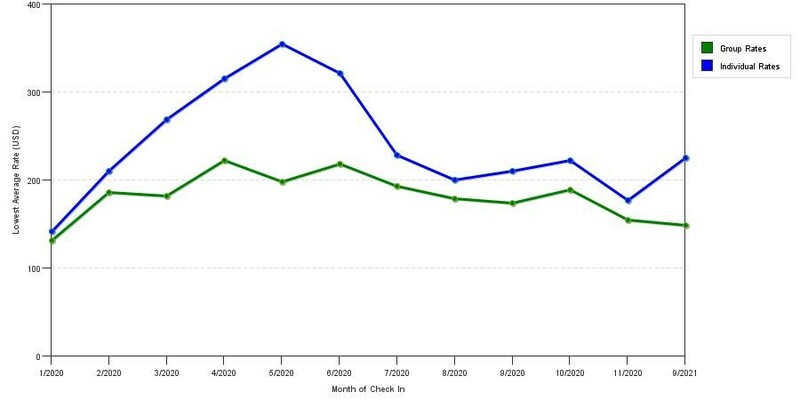 The graph above is averages of room rates for both group prices and the lowest online individual rates our system could find at the time the group offer was submitted. The lowest group/meeting discount shown is 34.1% in September 2017 and the highest average individual rate is $371 in the month of March 2020. This chart will show past seasonality and also project future months. If you are flexible with dates, you may want to consider staying at Homewood Suites Washington D.c. Convention Center in a month when rates are lower.